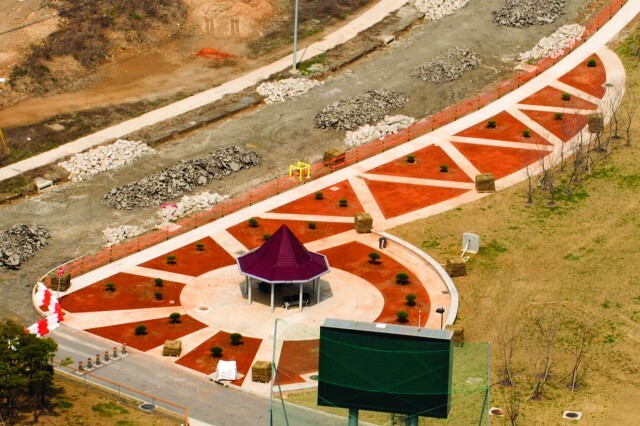 CAMP HUMPHREYS, Korea -- There's a small park with a gazebo near the Humphreys High School athletic fields that 13-year old Raymond Santiago walked past every day. The park was overgrown with weeds and grass and seemed a sad place to him. 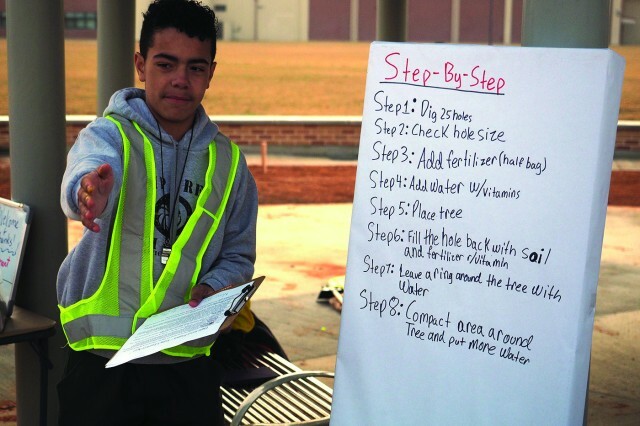 Santiago, an eighth-grade student at Humphreys Middle School is also a Boy Scout and candidate for Eagle Scout, the organization's highest honor. The poor state of the park gave him an idea--why not fix it up for his required Eagle Scout project? "I see it every day, it looked dark and sad, I wanted to change it and make it better," Santiago said. "I wanted to leave a good place." Santiago envisioned a park where people could sit and relax, enjoy the summer or visit during high school football games in the fall. "I knew it was going to be a nice project, it didn't look like it should have," he said. He first thought of the project in June 2016 and began planning for it. His goal was to clean up the area, and plant trees and grass. But first he had to develop his plan, contact the right people or agencies and bring it all together. He needed to clear the area of brush and debris, acquire trees, grass and the tools to make it happen. "Planning was one of the most crucial things about this project," he said. Santiago estimated he spent about 165 hours of preparation and planning before planting day. He visited a local tree farmer to look at trees and get cost estimates. He visited the work site ten times to measure it and do some test digging to determine how deep the holes needed to be to support his trees. 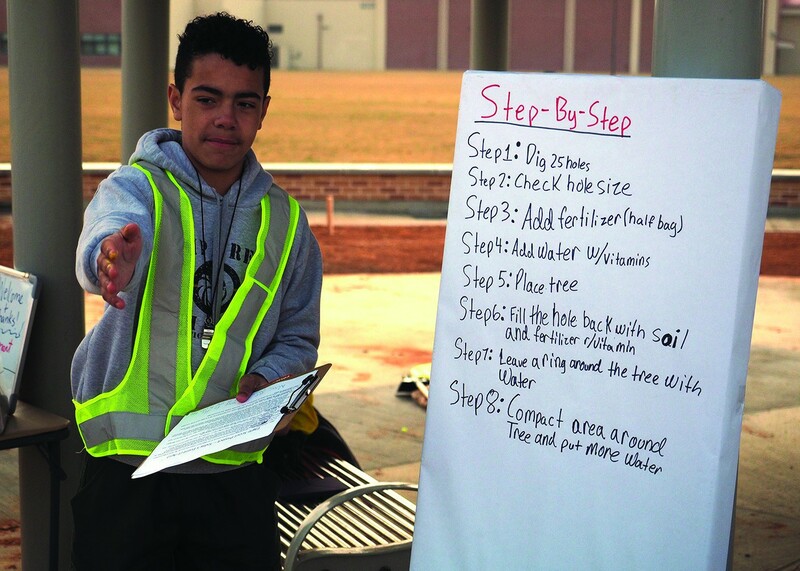 The months of planning and coordination came to fruition on Saturday, April 1 when about 40 volunteers--scouts, parents, students and friends--began turning Santiago's vision to a reality. 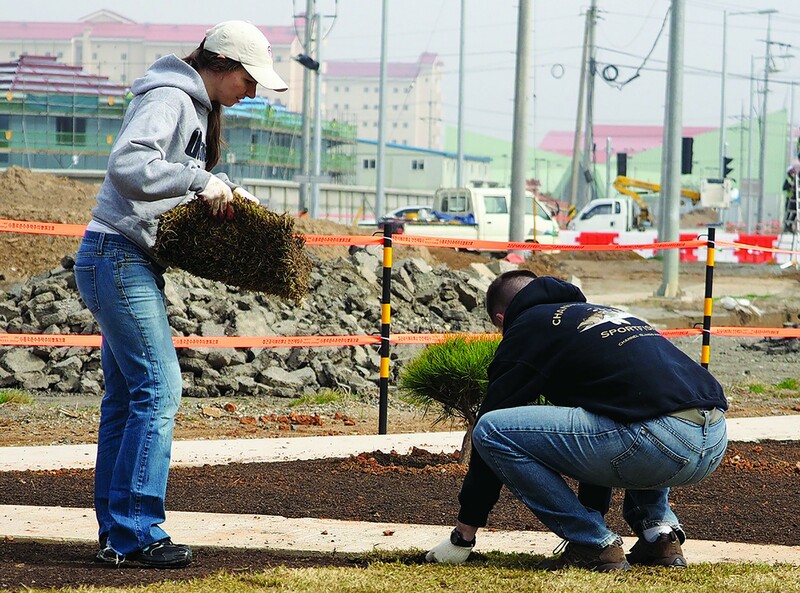 The Humphreys Garrison Directorate of Public Works had already cleared the site and replaced the topsoil, now it was time to plant 27 small evergreen trees. First Santiago briefed them on the project, outlining the steps and emphasizing safety above all else. 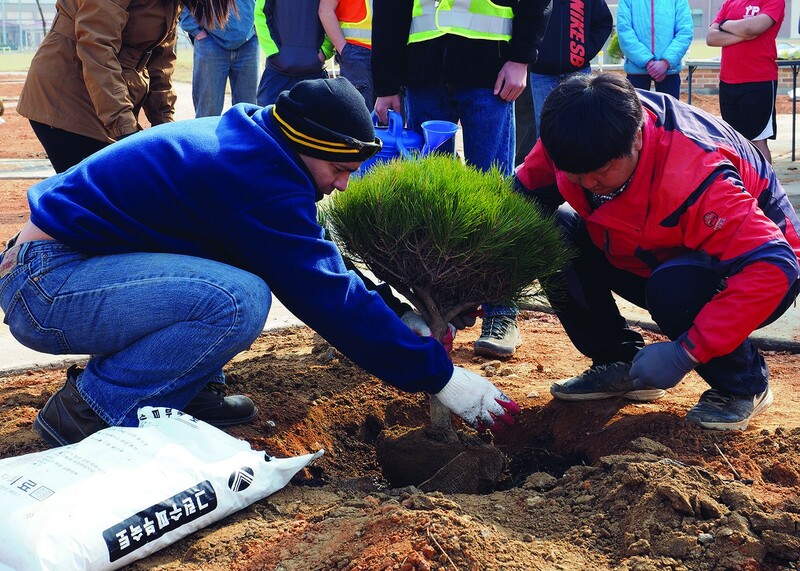 Local farmer Lee, Seong Gu helped the volunteers plant the trees. Lee showed how deep to dig the hole, the correct amount of fertilizer to add and then how to pack the soil properly around the roots. When the trees were in the ground the Humphreys Fire Department arrived with a pump truck and watered the new plantings. All of this happened under Santiago's watchful eye as he roamed the site, helping as needed and ensuring things went smoothly. The next step in Santiago's project was to lay sod over the cleared ground around the trees. 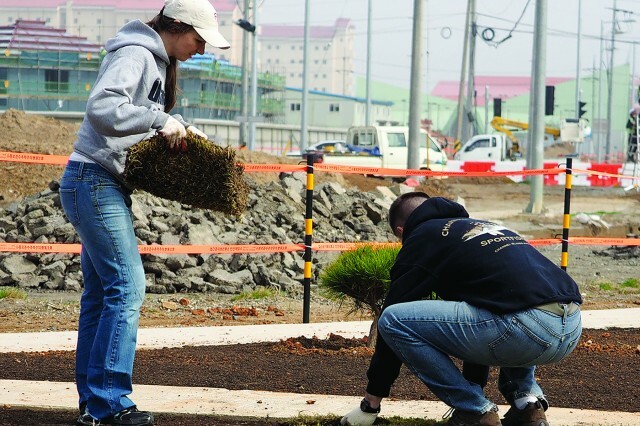 On April 8 more than 20 volunteers came out to do just that. Awaiting them were nine and one half pallets of new sod DPW Environmental Division donated for the project. 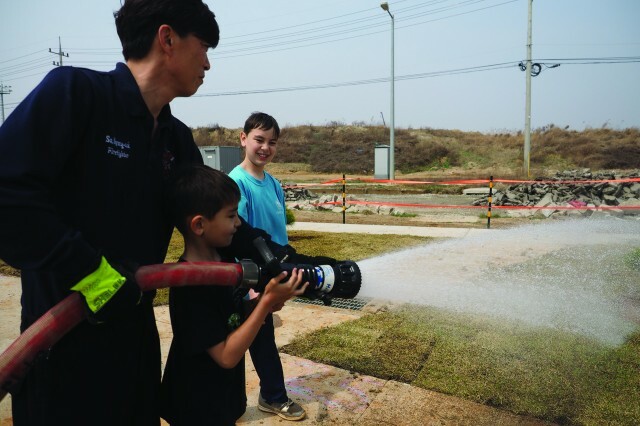 As on April 1, the Humphreys Fire Department sent a pump truck to water the freshly-laid sod. They even let some of the volunteers use the fire hose to water. Santiago said that he was grateful for the support from so many community agencies. In addition to the contributions from DPW and the Fire Department, the Humphreys United Club donated safety gear, work gloves and bottled water. The Veterans of Foreign Wars donated $500 for two benches for the gazebo. "A lot of people have donated and we're very, very grateful, it took lots of help from others," Santiago said. "There aren't enough 'Thank yous' for everybody." Now that his project is complete Santiago will face a board of review composed of scout leaders. They'll interview him, check his Scout uniform to ensure he's wearing it properly and pose questions regarding scouting and his life. They'll ask him to reflect on his scouting experience. "They make you think a lot about whether you're worthy to become an Eagle Scout," Santiago said. When he reflects on his Eagle Scout project, Santiago said it showed him he can do anything. "People don't have to be limited to some boundaries," he said. "It shows that, every time I walk past with my friends, that was my Eagle Scout project." 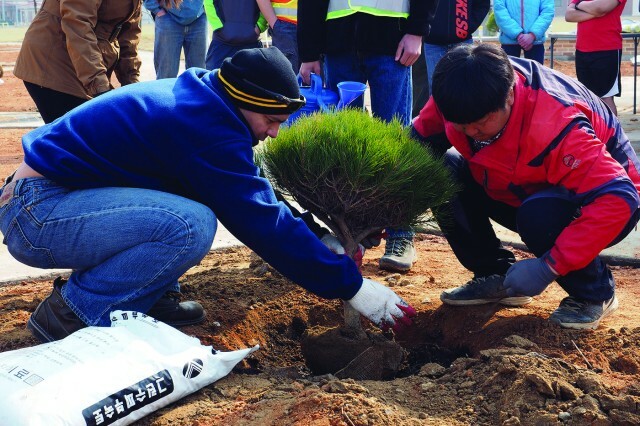 On April 8 when the sod was down and watered, as volunteers cleaned up the area, his project nearly complete, Raymond Santiago looked over the small park, reflecting. "It feels good and looks nice. I'm really proud of all the work and effort we put into it," Santiago said. "I had this vision and now, here it is."